If you're a woman who thinks there are opportunities out there to create wealth in all areas of your life, you'll love this event, part of Thalia Stanley Group's successful 'Women and Wealth' series. The series explores wealth as it relates not only to finances, but all areas of your life including physical and mental health, relationships and personal growth. At what will be an enjoyable and inspirational evening you'll learn about two areas of wealth in our lives how financial wealth for women is critical – and easier than it's ever been. 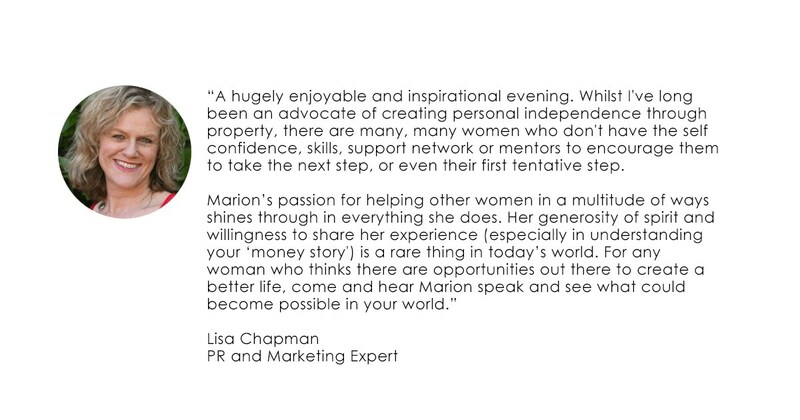 You'll hear from an authentic and empowering presenter in the company of other beautiful, committed and caring women. Founder of Thalia Stanley Group, Money Mindset Coach at Noosa Confidential and passionate advocate for the prevention of domestic violence. Marion will download her knowledge gained over 20 years & help you learn the rules that will deliver results for you in the financial wealth game, starting with where you are right now. Her approach is simple and tried and proven in the results she brings clients. Tickets to this exclusive event are strictly limited to 15, with previous events selling out quickly. 100% satisfaction money back guarantee for all attendees. 100% of nett proceeds are donated to the prevention of domestic violence against women and children. Share this event with other fabulous women you know and use the hashtag #WealthIsWomensBusiness.